Who Will Top Season’s Second Rallycross Event? After a nearly missing the traditional start to the Rallycross season, the ARX season made up for a delay with a thrilling race in a new setting, England. Now, it readies for its first U.S. event in Houston. For a time this year season, it looked as if there would be no rallycross season. The former main supporter of the season GRC Rallycross had run out of money. Indeed, they had left a wake of unpaid bills in their trail. For example, they owed the state of Michigan more than $76,000 for the use of a site, while they left a track with only a partial payment of $6,000 while failing to pay the rest. Indeed, things looked bleak. Enter the White Knight that rescued the driving championship for 2018, the American Rallycross Championship (ARX). They announced a renewal of rallycross racing this season, picking up where Global Rallycross had left off. First Event Was In The U.K. 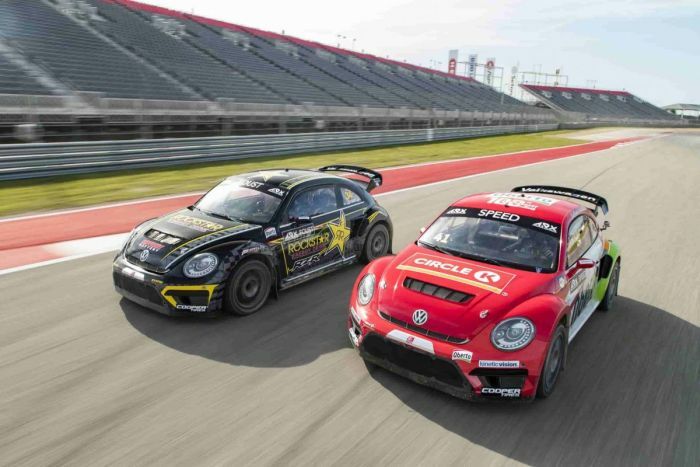 In the first event of the season at Silverstone in England, Tanner Foust, one of the two drivers on the Volkswagen Andretti Rallycross (VAR) team, took first place honors; standing out as the initial leader in the individual driving championship. Scott Speed, the second VAR driver, ran second, picking up driver points. The race series has moved back to this side of the Atlantic. This time, when the flag drops on the first qualifier this weekend, it will be in Houston at the Circuit of the Americas (COTA). At that time, Foust is looking to increase his current lead in the points standings, while Speed not only seems to keep this from happening but also hopes to gain in the championship points column himself. At the inaugural Silverstone event, the VAR team enjoyed near-perfect success. Foust was virtually untouchable in his No. 34 Rockstar Energy Drink Beetle Rallycross. He scored top-three finishes in each of the weekend’s four qualifiers. The three-time rallycross champ won easily in his semifinal, ending up on the pole for the final. A quick start put Foust into an early lead, which he protected throughout the race, bringing him the first checkered flag of the season. “It was an amazing experience,” Foust told an interviewer, “to take home the first win of the season and series.” He said his team worked hard “to get the Rockstar Beetle ready for the new series and it paid off.” With Round Two, his team faces new challenges and fresh, but familiar “competitors to the start line. “Still, I am confident VW and Andretti will put together the winning setup,” he concluded emphatically. Scott Speed, the pilot of the No. 41 Oberto Circle K Beetle had a more challenging weekend and the path to the podium in England. In the second qualifying heat, he had a minor setback with another competitor’s vehicle. Otherwise, Speed finished second or higher, winning his Semifinal heat starting next to Foust on the front row of the Final. The new permanent rallycross track at COTA is inset to turns 12 through 16. Just over half-a-mile long the new course is comprised of 40 percent dirt and 60 percent asphalt surfaces. Livestreamed coverage on July 14 will be on the ARX Rallycross Facebook page. The ARX highlight broadcast show of the July 14th COTA round will air on CBS Sports July 18 at 8 p.m. (EDT).